« Vestiges of the Great Western Power Co. It took more than a generation for Oakland to secure today’s electric power system under Pacific Gas & Electric Company. 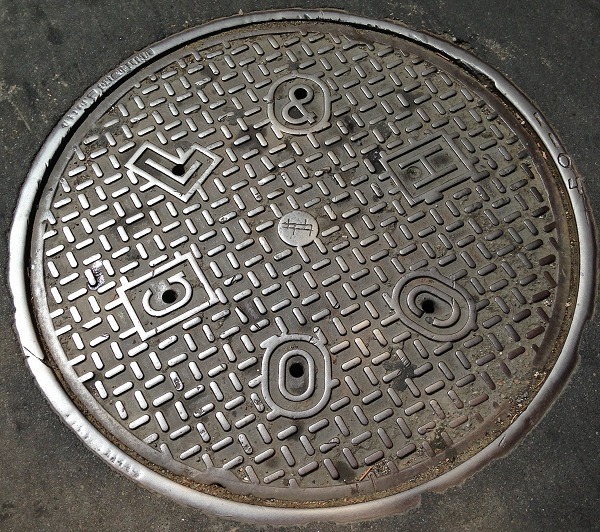 Last week I showed you some surviving utility-hole lids from PG&E’s largest competitor in Oakland, Great Western Power Company of California. Here are two more from a century ago. Another utility firm from those early days was the Oakland Gas, Light & Heat Company. The Oakland Wiki states that the company took this name in 1884, having previously used several variants of Oakland Gaslight. It’s listed by that name in the 1898 and 1910 business directories, with headquarters at 13th and Clay streets. Unfortunately I don’t have a precise recollection of where this lid is; roughly Jefferson and 18th streets. But I’ve seen several. For a time, there was also the Berkeley Electric Lighting Company. I think that’s the firm behind this lid. Originally the Berkeley Electric Light & Power Company, it was listed in the 1898 directory under the name Berkeley Electric Lighting Company at 2110 Center Street, Berkeley. In 1908 it was listed at 2225 Shattuck Avenue, but by then it was formally a branch of the Oakland Gas, Light & Heat Company. 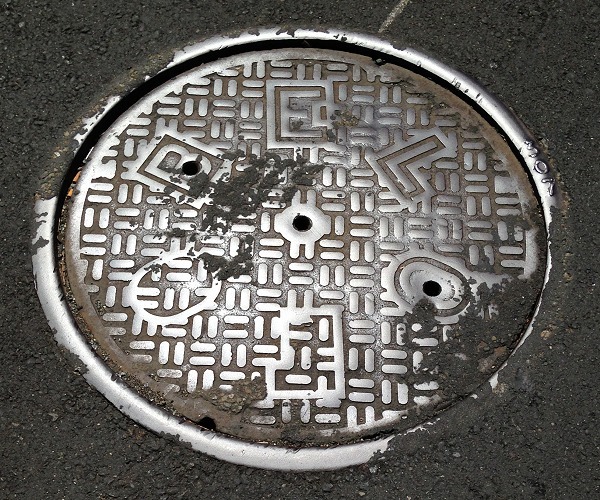 The odd shapes in this lid may represent the initials that got removed when the company changed its name. I’ve seen a couple of these. Incidentally, since last week’s post I’ve found more Great Western Power Co. lids in Franklin Street as far down as 11th Street. It’s not always easy to check these things in the middle of the street! This entry was posted on 10 June 2016 at 8:03 am and is filed under Access covers. You can follow any responses to this entry through the RSS 2.0 feed. You can skip to the end and leave a response. Pinging is currently not allowed.